Inside the National Shrine of St. Francis of Assisi on Sunday, the congregation had grown unruly. Many parishioners barked. Others screeched. Only the rabbits seemed to be minding their manners. So it is at the blessing of the animals, among the highlights of the 58th annual North Beach Festival. The sprawling outdoor event took over the neighborhood with art, music, shopping and more. Entire Article and Photos Available Here. 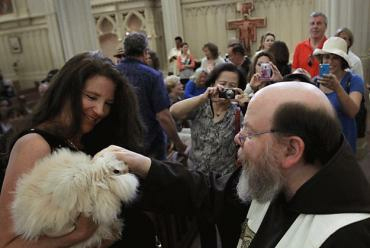 Father Gregory Coiro blesses Starbucks, Kathleen Hewtson's angora bunny, at the annual Blessing of the Animals at The Shrine of Saint Francis of Assisi during the North Beach Festival in San Francisco, Calif., Sunday, June 17, 2012.